(Newtown, PA – February 21, 2014) — CenTrak today announced availability of the healthcare industry’s first scalable single-use patient tag. The development of this technology was driven by demand from leading hospitals and solution providers who are determined to improve the efficiency and safety of patient care. The ultra-thin, low-cost, and waterproof device leverages the same core Clinical-Grade RTLS® technology that is already deployed in over 450 healthcare facilities. CenTrak customers, including the US Department of Veterans Affairs’ 152 medical centers and 1,400 clinics, can now experience all of the benefits of patient tracking – including improved capacity management, workflow automation, increased ED throughput, and enhanced patient safety and security – via the cost-effective solution. Utilization of CenTrak’s single-use patient tag, which can be discarded or recycled, eliminates concerns associated with the cost of tag loss and complexities of tag reuse. The device enables the first scalable patient tracking solution that can be affordably implemented enterprise-wide, even across large, complex acute care organizations. Enterprise-wide patient tracking improves staff workflow, allows automation of The Joint Commission recommended patient flow standards, and improves patient safety and satisfaction. CenTrak’s partnerships with industry-leading patient flow and capacity management application providers enable turnkey solutions that can record patient location history, patient-staff and patient-equipment interactions, as well as help determine the next steps in patient care. Visibility enables improved workflow that can reduce delays and wait times, especially in costly high acuity areas. These improvements impact patient satisfaction, HCAHPS scores and, potentially, reimbursement. Healthcare facilities with knowledge of patient location can mitigate the risk of “lost” patients and the associated potential safety hazards, while staff can improve communication to increase productivity. 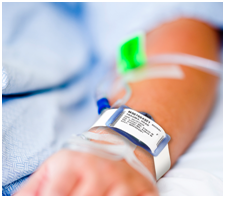 CenTrak’s small and slim single-use patient tag “disappears” under a hospital ID wristband. CenTrak’s single-use patient tag is fully waterproof and its slim design allows it to “invisibly” fit on a standard hospital-issued patient ID wristband (see included image). There is no need to purchase additional wristband accessories, minimizing changes to current patient admissions and discharge procedures. The devices are interoperable with CenTrak’s battery-powered, certainty-based components and meet Clinical-Grade Locating™ standards, including accuracy at the room-, bed-, and bay-level. Tags will be available to hospitals through a limited number of approved CenTrak partners. CenTrak’s Single-use Patient Tag will be featured at HIMSS14 in CenTrak’s booth #5645.